Was it He or She that Shot the Buck in Buckhead’s Name? Buckhead Heritage was able to bring “The Gun” that is believed to have shot the Buck Buckhead is named for in 1838 back to Atlanta on loan this Spring. First shown at our February Patrons Event, it will also be available for attendees to see at our April 28th Mansions, Gardens and Ghosts History Tour. The Whitley’s moved to Buckhead from North Carolina in the mid 1830’s, and initially lived near the intersection of Peachtree and West Paces Ferry Rd. 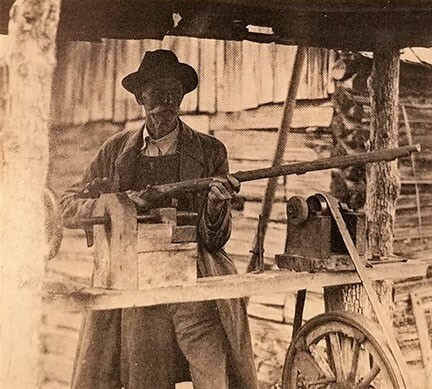 Their neighbor Henry Irby opened a saloon and general store nearby, and Buckhead was originally referred to as Irbyville. West Paces Ferry Rd, then called the Peachtree Trail, intersected with the Decatur and Roswell roads at the nearby crossroads. The Whitleys are reported to have shot a large buck, and left the head on a tree, giving the area the name Buckhead. There are conflicting reports as to whether it was Mrs or Mr Whitley that actually shot the buck. The Whitley’s ended up buying 40 acres and building a log cabin in 1842 in “Upper Vinings”. Their grandson James Whitley was born in that cabin in 1873, and lived there until 1961, when I 285 was built. The gun was still hanging over the cabin fireplace. James Whitley even offered the Georgia DOT the famous weapon if they’d move the new road over a few hundred feet to spare his cabin. 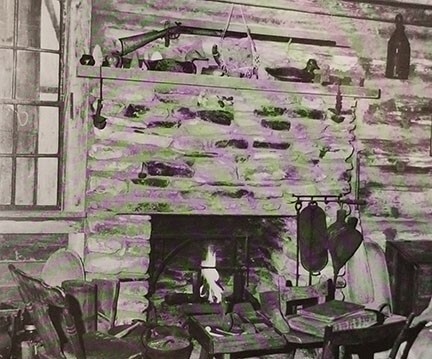 A local doctor and friend of James Whitley moved the cabin behind his house in Buckhead, where it still sits today. An anonymous heir has graciously loaned this famous artifact to Buckhead Heritage this spring, thanks to the efforts of Fay Pearce. We’ll be researching and publishing more info about the Whitley’s over the next few months. Check the Buckhead Heritage website under History for future Whitley updates. Whitley cabin built in 1842 with gun over fireplace. Grandson James Whitley born in cabin in 1873, with gun. 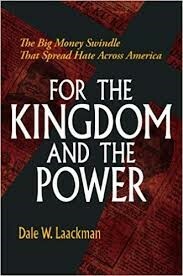 The next book club will review For the Kingdom and the Power: The Big Money Swindle That Spread Hate Across America written by Dale W. Laackman. The author will be traveling to Atlanta to discuss the careers of Bessie Tyler and her business partner, Edward Y. Clarke, who are the focus of the book. It is the story how two brilliant and talented people could change the face of America purely in the name of greed. They were amoral con artists of the first degree. We can learn from their actions to assure it cannot happen again. Bessie Tyler became very wealthy and built a Buckhead home now on the National Register, where Buckhead Heritage held their Holiday Party. This book club gathering is free to members, please register on Buckhead Heritage’s website here or call (404) 467-9447. This event will be held at the National Register home built by the subject of this book in Buckhead. Registered attendees will be sent address. Free event for members. 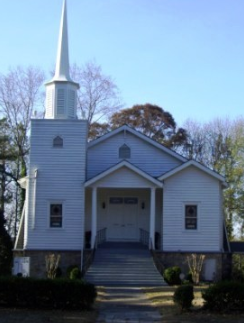 Buckhead Heritage will participate in the citywide Phoenix Flies program organized by the Atlanta Preservation Center with tours of the history of New Hope Church dating back to the late 1800’s. Short presentations and guided tours at 12 and 2. The congregation will host a BBQ for visitors. There is no charge for this event, although donations to the church will be welcome. Registration is not required. Guests will gather for drinks before embarking on a history-themed bus tour that will lead them on an adventure-filled afternoon through Buckhead. Buckhead Historians will emcee for guests riding in comfortable 26 passenger buses on a tour through a Buckhead not typically seen or experienced. En route, guests will hear little known stories and fun facts about Buckhead, and notable Buckhead historical figures in period costume will entertain and inform participants at various points along the way, with refreshments served. Hear about both our famous and infamous local history at this unique event. At the end of the tour, guests will return to the festivities at the historic Philip Shutze designed Atlanta International School for a casual dinner and a rousing closing celebration. Guests will compete for prizes in a Buckhead Secret History competition, assisted by Buckhead historical figures met on the tour. Now online on our website is an interactive map showing historic sites throughout Buckhead. 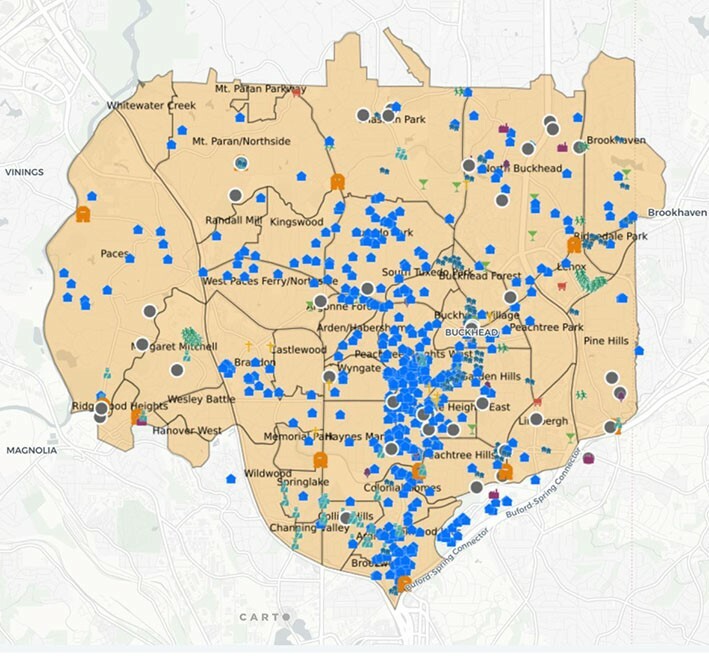 Website visitors can zoom into various Buckhead neighborhoods and click on points on the map to find out more about what’s historic in their area. Users can also search by neighborhood, architect, or comments to find things around Buckhead. Popular searches include Philip Shutze, Bobby Jones, and Gone with the Wind. We have also added an online nomination form for users to submit information on additional places in Buckhead. We encourage everyone to help us gather more historical information on Buckhead and our historic places. 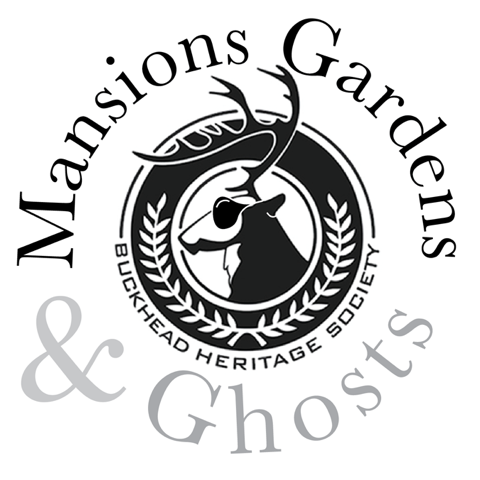 Buckhead Heritage is a volunteer run group and can always utilize a variety of skills, including folks to help at events, cemetery cleanups, and on several preservation projects that could use research, committee and leadership help. If you’ve like to have some fun, learn something while helping the community, and meet some neighbors then we’d love to talk to you. Please contact Richard at the office.